Information technology is an increasingly important element of organizational products and services and the foundation of enterprise-wide processes. The tight linkage between IT and organizational processes means that the IT unit cannot bear sole responsibility for the effective use of information and IT. As a result, “getting more value from IT is an increasingly important organizational competency, and leaders throughout an enterprise must develop this competence” (). This message is strong evidence for the necessity of a better understanding of the mechanisms that govern the information life cycle, and consequently, the correspondent information technologies inside and across enterprises. Aside corporate governance, the IT governance is becoming a crucial activity in modern enterprises, and for this reason, this chapter presents the most important aspects that relate the architecture dimension of enterprises and the architecture of markets to the growth of enterprises and of markets. The chapter also examines some aspects of measurement of IT governance implementation and presents important recent features of IT governance in financial markets. DO YOUR information technology (IT) capabilities enhance your competitiveness? Do managers throughout your organization recognize their responsibilities for the effective management and use of IT- or do they assume that the IT department will manage IT? Do your IT investments target enterprisewide strategic priorities – or does your firm squander resources on diverse tactical initiatives? Simply put, are you getting acceptable value from your IT investments? These authors argue that firms manage many assets – people, money, plant, and customer relationships – but information and the technologies that collect, store, and disseminate information may be the assets that perplex them the most. Business needs constantly change, while systems, once in place, remain relatively rigid. IT implementations involve both up-front and ongoing investments for outcomes that no one can precisely predict. These uncertainties and complexities lead many managers to abdicate their responsibilities for ensuring that their people use IT effectively (Weill & Ross, 2004). In addition, Weill & Ross (2004) remind that for many years some organizations could succeed despite weak IT management practices. But information – and consequently IT – is an increasingly important element of organizational products and services and the foundation of enterprisewide processes. The tight linkage between IT and organizational processes means that the IT unit cannot bear sole – or even primary – responsibility for the effective use of information and information technology. As a result, “getting more value from IT is an increasingly important organizational competency, and leaders throughout an enterprise must develop this competence” (Weill & Ross, 2004). Thefore, getting more value form IT becomes a key driver behind the need for a better understanding of the mechanisms that govern the information life cycle, and, consequently, the correspondent information technologies inside and across enterprises. 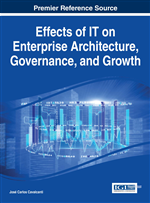 Aside corporate governance (seen in chapter 9), IT governance is becoming a crucial activity in modern enterprises, and that is why this chapter presents the most important aspects that relate the architecture dimension of enterprises and the architecture of markets to the growth of enterprises and the growth of markets. The chapter also presents a brief examination of aspects of measurement of information technology governance implementation, and shows important recent features of IT governance in financial markets. They learn from each implementation, becoming more adept at sharing and reusing IT assets. Their justification for top-performing enterprises succeeding where others fail is due to the implementation of effective IT governance to support their strategies. For example, enterprises with above-average IT governance following a specific strategy (such as customer intimacy) had more that 20 percent higher profits than enterprises with poor governance following the same strategy (Weill & Ross, 2004).